Party like it's 2007, the year "The Departed" won Best Picture. In 2007, I played the Crackdown demo more than probably any other Xbox 360 release that year. The demo, not the full game. It was probably a year or two before I bought a copy of the full game, but the Crackdown demo had a generous one-hour timer on it, and in that one hour you could do whatever you wanted. Skill progression was accelerated as well, I think, so in that hour you could easily get to the point where you were jumping over buildings or tossing cars at enemies. It was amazing. Not only were open-world games relatively new and novel in 2007, but none were as willing to let you break the experience. Nothing was a legitimate threat in Crackdown. And how could it be? You could jump four stories into the air, carry an entire arsenal of explosives, power-lift cars, punch an enemy down an entire city block. There was a punk rock feeling to it, almost. We’d entered this era where video games took themselves deadly serious. 2007 was the year BioShock released, and the original Assassin’s Creed, The Witcher, Call of Duty: Modern Warfare, Uncharted, Mass Effect. These games went on to define a generation, and in some cases the next generation as well, and all of them stemmed from this “Video Games Are Art” mentality. Even the dumb ones, they tried so damn hard to not be dumb. Just as punk eventually spawned pop punk though, Crackdown’s impertinence became a genre of its own. Saints Row probably capitalized best on those “The game is broken on purpose” ideas, but Just Cause isn’t far removed either, nor is Darksiders. Hell, even a “realistic” series like Far Cry has dipped into the Crackdown well at times, with Blood Dragon and this week’s Far Cry New Dawn. Which I guess brings us to Crackdown 3. I know, it’s been a lot of words to get to this point. Context is important though, not least the context that Crackdown started out as an endearing and scrappy little experiment. I’d never go so far as to say the original Crackdown is an all-time great game, not even for the 360’s oeuvre, but it’s a game for which I have a lot of fond memories, and one I could’ve been excited about an Xbox One-era sequel. Not this sequel, though. Not Crackdown 3. In part it’s because others have done what Crackdown did in the years since, but better. 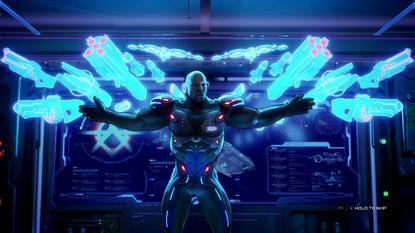 Saints Row IV is just Crackdown without the cops, and with a more memorable story. Other games have thumbed their nose at the self-serious side of the industry, have done the ultimate-power-fantasy shebang and done it well. But that’s not the whole explanation. It’s not like there’s only room for one of this type of game, or anything. A Crackdown 3 that really went for it, that felt as bold and daring as the original did in 2007, that could’ve really been something to see. 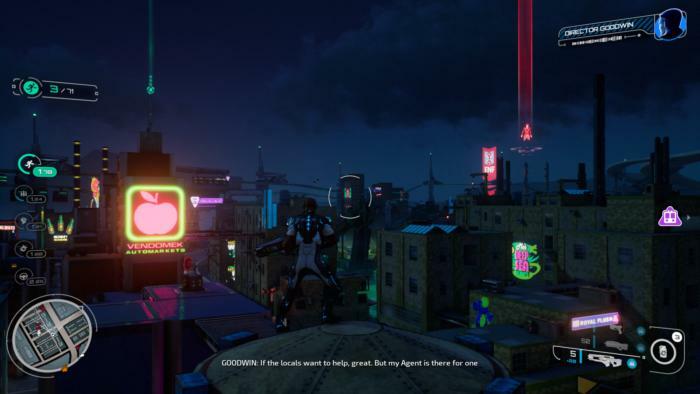 What makes Crackdown 3-that-actually-exists so odd though is the utter lack of ambition. It’s not just not-bold and not-daring, it’s regressive. It slavishly adheres to the same structure, the same ideas as the original, with no nods to how tastes have changed in the ensuing decade. As I said in our preview a few weeks ago, that can be somewhat refreshing at times. 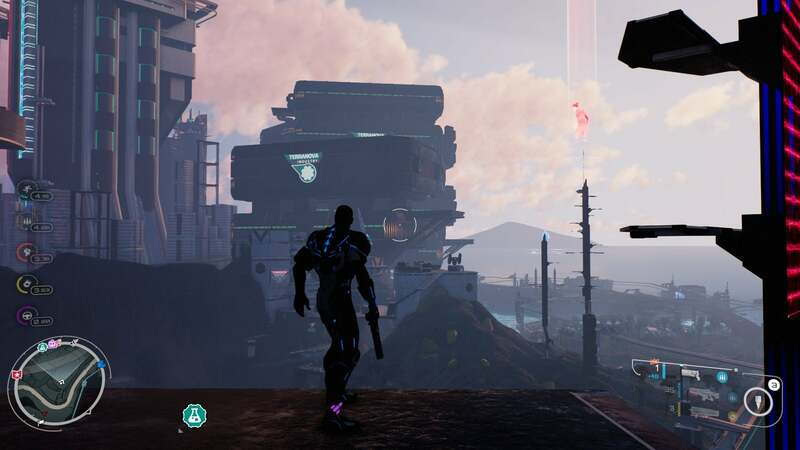 Crackdown 3’s still unique, in that its open-world is really an open-world. The entire setup is nonlinear, meaning you can take a crack at the final boss as soon as you start the game. You probably won’t succeed, but you can try. That’s an idea that deserved to be resurrected from 2007. It wouldn’t work for every game, but it works here, and more importantly it’s interesting. So much of Crackdown 3 is not interesting at all. Fully 90 percent of it is jumping around the city doing busywork. Sometimes you’re freeing prisoners, other times you’re blowing up fuel refineries, other times you’re taking over monorail stations. Inevitably it just means “Go to a location and kill everything until one of your two chatty boss-narrators congratulates you and says you killed enough.” Scrub one more icon from your map. Do these activities enough (each repeats about a dozen times), and you’ll open up a boss battle. That’s the other 10 percent of the game, and it’s just as generic. Hell, at least three out of the nine boss battles are mechs, literally indistinguishable from each other except for the weapons they use. The final boss is the most visually interesting, but that one was undermined by the fact I found a platform where I could literally stand in place and shoot rockets at it until it died its inglorious death. Hell yeah. Roll credits. 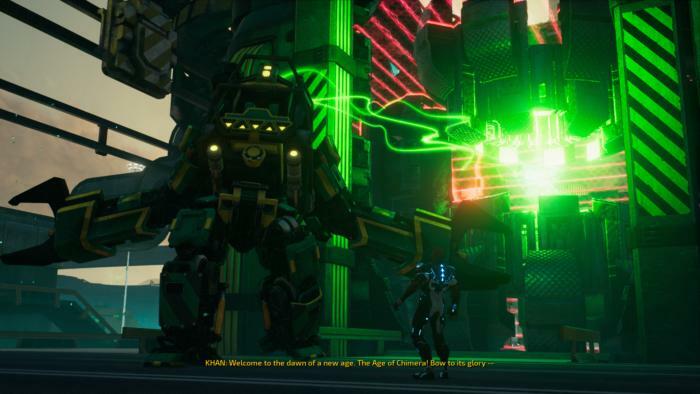 Here’s the thing: Crackdown 3’s not even bad! Bad implies you hate something, or have a strong emotional response to it. Crackdown 3 just exists, which is worse in a way. I’ve played and reviewed a lot of games in my life. Generally, even the terrible games, you can see what the developers hoped to achieve. They didn’t, and that’s always sad, that unrealized potential—but you know why a game got made, what spark of an idea led to its creation. Honestly I think of that as part of my job, writing reviews. Anyone can point out whether a game is bad. More interesting is pinning down a developer’s goals, an idealized version of the experience, and then discussing where execution didn’t match ambition. As Crackdown 3’s credits rolled though, I realized I still didn’t know what those ambitions were. 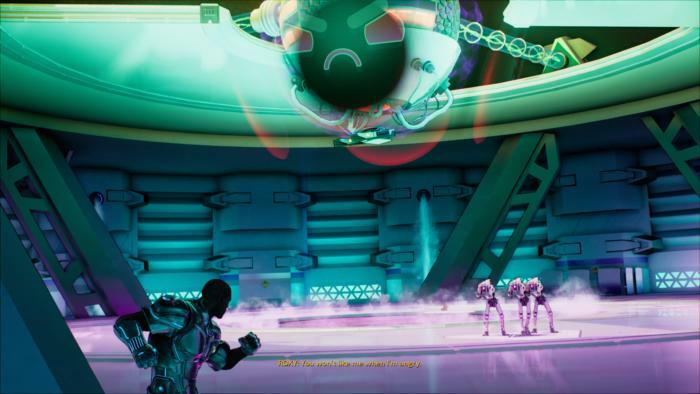 Like, was it the backend cloud technology—now limited to the tacked-on multiplayer modes—that drove Crackdown 3’s development? Does someone high up at Microsoft just really love Crackdown? Because what we have here isn’t terrible, not in a product sense. It functions as advertised. Performance is great. The art direction for the city of New Providence can be stunning, at times. Terry frickin’ Crews is in it, even if he only speaks for about three minutes in the opening cutscene and then never, ever again. Regardless, it passes in a blur and then it’s gone. Nothing about Crackdown 3 stands out. It doesn’t break new ground, nor does it seem like it even wants to. Microsoft could’ve just remastered the original Crackdown, put it on the PC and the Xbox One, and it would’ve fulfilled the exact same purpose without taking seven years to develop. And then Crackdown 3 has the audacity to tease a sequel at the end! I just don’t understand it. I don’t want to make light of the work that’s gone into Crackdown 3. It’s clearly been a hellish process getting this game out the door. But I don’t understand what the goal was here, or why Crackdown 3 was allowed to see the light of day while so many other Xbox One projects were killed off before release this generation. There is that multiplayer mode, of course—a showcase for Microsoft’s cloud-based destruction tech. And hey, that tech is cool. Maybe five or ten years down the line it’ll change how games are developed, or how they’re run on the player’s end at least. But if that’s the sole reason for Crackdown 3’s existence, a proof-of-concept for a dream Microsoft pitched more than five years ago, it seems criminal to have that shunted into a tacked-on multiplayer mode I can’t imagine most people play past the first few rounds. Like so much of Crackdown 3, it feels generic and perfunctory and dated, destruction tech be damned. I hope Microsoft can find a better use for those dreams in a more interesting context, maybe on the next hardware generation. 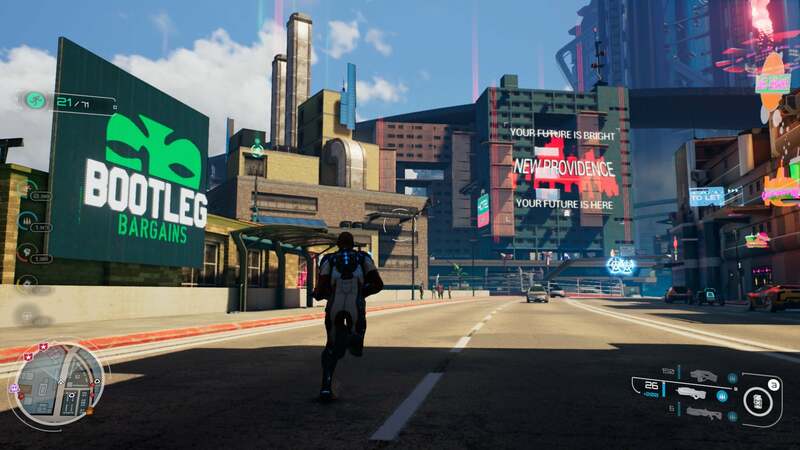 Crackdown 3 is the perfect capstone for the Xbox One in a lot of ways. Oh sure, the generation’s not over yet—we’ll get another Forza or two before the changeover, maybe a Gears of War. But you have to imagine Microsoft’s focus is on the future at this point. The Xbox One entered this generation on the back foot, and while Microsoft’s laid a lot of groundwork for better days to come it’s spent most of the last six years looking kind of lost, playing it safe when it should’ve taken more risks and placing bets that never quite panned out. And Crackdown 3 might very well be the last of those legacy bets, a confusing end to a confusing era for Microsoft. We can hope, at least.